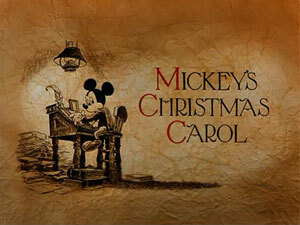 Mickey’s Christmas Carol is about as close as you can come to a straight retelling to the original telling of Dickens story as I can tolerate. Probably because (1) the characters are much more exaggerated as to not really be believable…not that the original Ebenezer Scrooge wasn’t an exaggeration of the worst caricature of robber barons, a man who enjoys that he “Rob[s] from the widows and swindled the poor” but because Dickens really believed the rich were like that and treated all of his rich characters in that preposterous socialist-fantasy way. (2) Because while it is a straight re-telling (sort of) the whole thing doesn’t last that long (a blessedly short 25 minutes) …And (3)I love Disney too much to care about any flaws this story might have. I don’t like the original story, as it has all of Dickens’ bleakest aspects, but there is now way to not love Mickey as Bob Cratchit, Goofy as the ghost of Marley, and Donald Duck as Scrooges nephew Fred. And even though Uncle Scrooge is villainous (charging 80% interest…which would make most loan sharks more friendly in setting their vig) he is not completely a victim of his circumstance, unlike the character in Dickens, but as Jiminy Cricket/ The ghost of Christmas past points out that he was the one responsible for creating his life. (Free will was never a big thing for Dickens in any of his stories). Also, unlike the original, this Scrooge doesn’t take much convincing. Two minutes looking at Tiny Tim and he’s already utterly concerned for the boy’s well-being. In the real story Scrooge is only finally convinced by the fires of hell. Now there are a lot of good things that the entire Christmas Carol story has, and I’ll deal with them later when we come to other versions of the story in our countdown of great Christmas films. For now I will just recommend the sweetness of this short little Disney masterpiece. No we’re not talking about Barney Frank or Harry Reid or other such political figures (not that it doesn’t apply)…we’re talking about the Grinch. The Grinch when it was simple and to the point and not desecrated by Jim Carey and Ron Howard’s narcissistic need to improve upon perfection. We all know the story. It’s a simple one with simples truths. The truth that there are those people who are so offended by other people being happy that they for some reason feel the need to attack that which doesn’t hurt them but makes the other person happy…you know like the people who get offended when you say Merry Christmas. And finally that Christmas has the amazing ability to bring out the best in even the worst of us is if we just let it. It can grow a heart two sizes to small a whole three sizes. What more is there to say about this Dr. Seuss classic.